November 17, 2011. Prior owner Don Moore advises that #128 has been sold to Alan Folsom, also of Plattsburgh, New York. And, your webmaster has spoken with Alan. He is 'checked in"! We'll reserve a space up here for Alan's picture of his new boat. 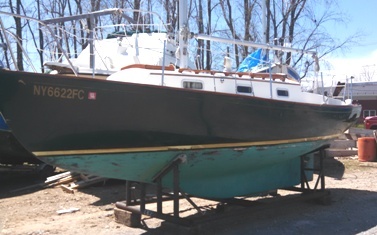 May 7, 2016 Hard working, Buffalo, New York based Senior DFI John Cotton, noting that we have not had recent updates or photos of Delphinus, made a long trek east to a boat yard in Plattsbug and checked her out. Here's his report and photos. Click on the photos for a larger image. Walking around in Plattsburgh, New York today, and the first boat I see in the yard, a Dolphin. :-) I believe this is #128 from your roster. Didn't talk to anyone about her, but she looks pretty good. 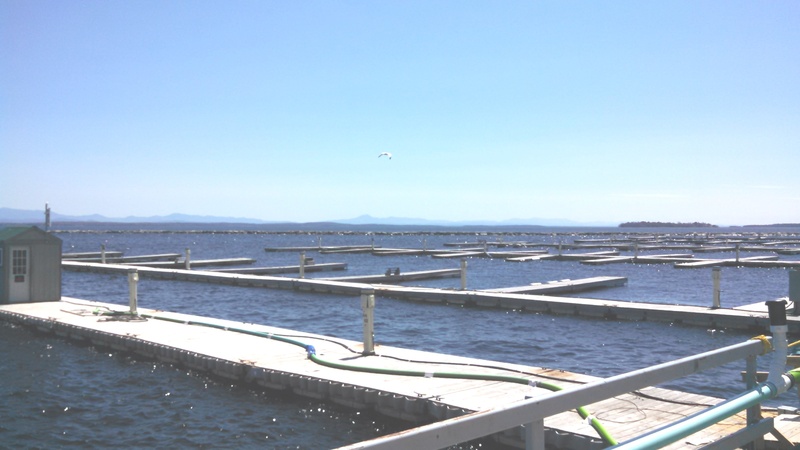 Beautiful weather and a nice breeze on Lake Champlain today, but nary a boat in the water yet. Photos attached. Marionette has the same kind of 'dodger"
I love what you have done with the website. It has helped me fall in love with my '69 Yankee Dolphin 24' Hull #128. Yes, I am the proud new owner having bought it from Bill Kelting just this Saturday. Would you please update me on your website? Please let me know any additional info you want. For right now I do not have pictures yet. However we have grand dreams so I hope to send exciting pictures. Even though my 16 yr old son and I are brand new to sailing we intend to compete in the Mayors Cup next year. 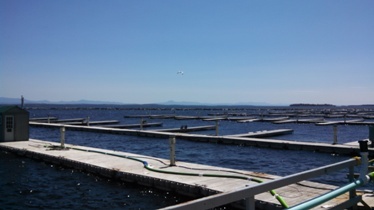 This is an annual race on Lake Champlain, NY side, in Plattsburgh, NY. We have friends who will give us a crash course in sailing this summer to prepare. Hopefully it will be a non-crash course. 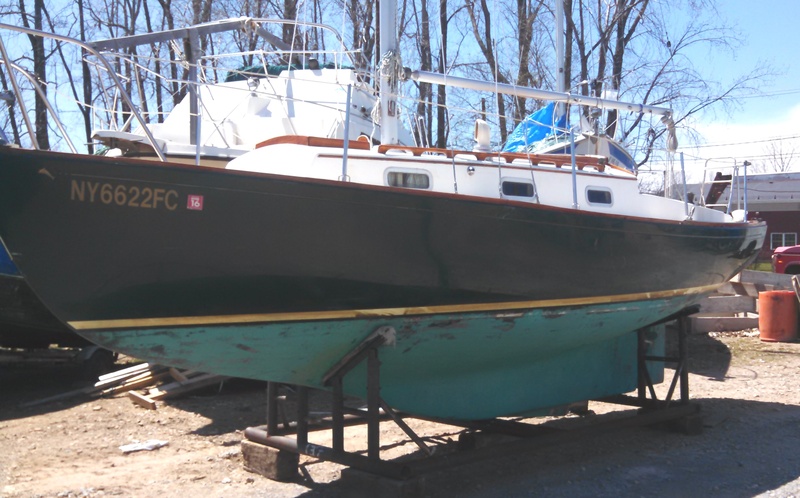 All the restoration stories and just the excitement that jumped off the page when new owners "discovered" their sailboat is a lot of fun to read. Please keep up the great work and wealth of information. Webmaster Note: Thanks Don, and Bill, for the Vire link. When time permits will get this link and more on the Vire engine up in the Technical Section. Here are Bill Kelting's emails and more photos. Thanks for keeping up the website. We have Dolphin Hull #128 built by Yankee Yachts in 1969. We keep her on Lake Champlain and have been sailing her there for about 12 years. It is powered by a 5hp Vire inboard (about 50% Marinetex) and going strong (sort of). A great boat. Will send some pictures soon. We keep Dolphin #128 on the New York State side of the lake. She currently resides at the Mooney Bay Marina, a few miles north of Plattsburgh, NY. Her name is "Delphinus". I am attaching a few photos. Sorry for responding so late but we have been out cruising on the lake for the past few days. September 28, 2010. Dolphin 24s are winning races! Here's Delphinus' winning crew in their division at the Mayor's Cup Regatta on Lake Champlain, New York. 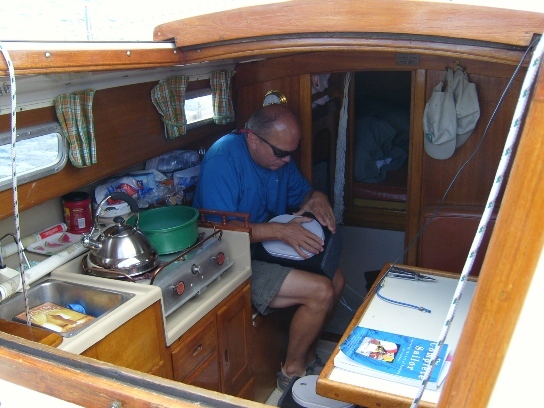 Here are some pictures of my first summer 2010 sailing Dephinus. 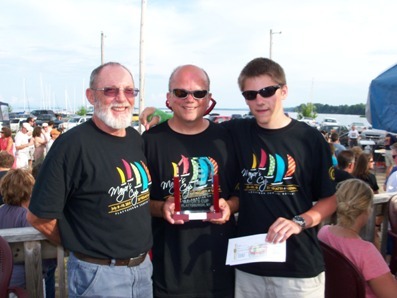 We won the Mayors Cup race in our cruising division class, and came in 19th in the total Cruising class of 37 boats. 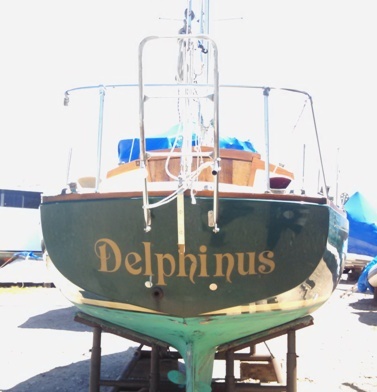 On September 28, 2010 Don advised Delphinus is For Sale. On December 14, 2011 he updated the ad and reduced his asking price from $8750 to $7500. This is the updated CraigsList ad. 1969 Yankee Dolphin 24. Sparkman Stephens design, LOA 24' 2", LWL 19',0", Beam 7'8", displacement 4250#, ballast 1750#, shoal draft keel w/ centerboard . Draft w/ centerboard up 2'10", centerboard down 5'2". New gell coat on hull a few years ago. Main sail is like new w/ Dolphin logo & # 128. Working jib, 150% genoa, "drifter" jib sail (just repaired). New halyards, rigging tuned up & new windex. 2 Danforth anchors, CQR storm anchor & "lunch hook", alcohol stove, magma grill, head, table converts to bed & bed in V-berth, sink w/ pump. April 17, 2014. Former owner Joe Powell checked in with info about the first 25 yrs of #128's life. Click here to go to Annetta.